photo: Sidney Schultz buries one of her three-pointers in the win over Shoreline. photo by Rick May. Bellevue College women’s basketball bounced back into form when returning home tonight as the Bulldogs breezed to a 78-58 win tonight at Courter Family Athletic Pavilion. The Bulldogs put up 45 points en route to an 18-point lead heading into the locker room at halftime to give BC enough cushion for an evenly-played second half. Bellevue shot the lights out from the get-go, shooting 65% in the first quarter as they built a 25-15 lead. Amanda Luckett tossed in eight points and had three rebounds in the first quarter en route to a night totaling 19 points and 9 rebounds. Jahdai Alcombrack was solid all-around with 10 points and a team-leading 10 rebounds and nine assists. Sophomore Sidney Schultz drained three three-pointers and was 5-for-9 from the field for the night and added 13 points. 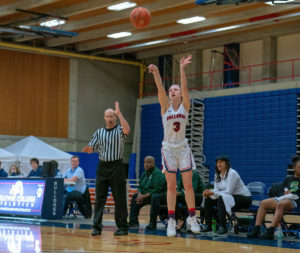 Luckett and Alcombrack’s control underneath aided BC’s dominance in rebounding as the Bulldogs outrebounded Shoreline 41-23. Bellevue is now 1-2 (5-10 overall). The ‘dogs will face off against Edmonds on the road this Wednesday January 23 at 5:00 p.m.